“How much does it cost?” I asked the driver, with Joani and Olivia looking on with their puppy eyes at the driver and two other persons in the automobile. We tried not to show our jubilance at the hearing of the good news, but it was too hard to keep it in. Olivia, Joani, and I had been waiting at the road side next to Lake Karakul of Tashkurgan in Xinjiang, China for more than 1.5 hours. 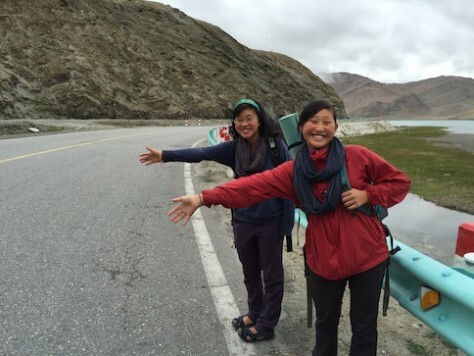 Forty-four cars or trucks had passed us but we still were not able to hitchhike a ride back to Kashgar. To our greatest joy, we finally got on on the forty-fifth try! We tried all sorts of hand gestures and facial expressions, in hope of getting the attention of drivers. 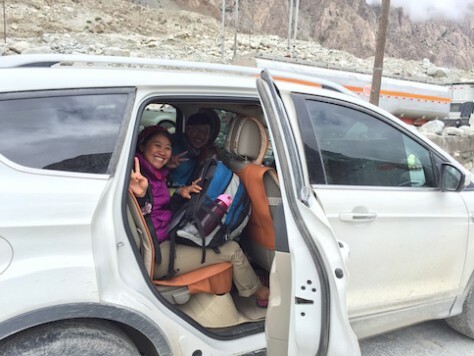 Annie and Nathan got a lift from the SUV, whose owner is a Henan man who is doing business in Kashgar. Earlier Annie and Nathan quickly flagged down an SUV after only 5 minutes and their 4th try, successfully got on to the vehicle. With their quick success, we thought it would not be too hard. But it was not to be. After 15 unsuccessful attempts, we started to feel desperate and began to try every trick we could think of. At first we tried changing the person who will be in front flagging down the vehicle. We started with Olivia, then Joani, then myself. There seems to be no difference. Then we thought we should hide our backpacks to not seem so burdensome for the vehicle. That didn’t work as well. Then we tried different hand gestures and different facial expressions. No luck. After 1.5 hours of waiting for someone to give us a ride, we all felt very discouraged. “I will go first!” Joani immediately came alive with energy fighting with Olivia to see who gets to be in front to flag down the vehicle. Olivia and Joani eventually took turn to see who can flag down first. But still no vehicle picked us up. Olivia and Joani cheered loudly for me as I tried waving at the 22nd vehicle. It got closer and closer. Whoosh…the vehicle passed us by without even slowing down. “No luck, dad!” Joani laughed. “Okay, what about 23?” I questioned. “23 minus 10 is 13. That’s Joani’s age,” Olivia creatively conjured. “Go Joani, go Joani, go!” We all chanted jumping up and down as Joani tried waving at the next vehicle. Whoosh…the vehicle passed us by just like all the others cars before. Later, Olivia was able to flag down two cars, but one could only take one person and the other could only take two. 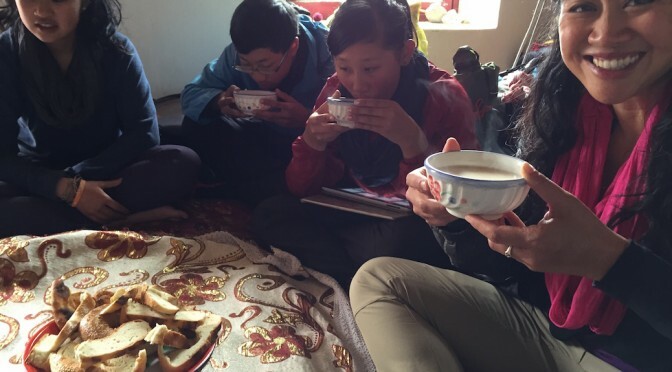 Not only were we given a free ride by the 3 Han Chinese, but they shared their food with us while we were stuck by the mudslide for hours. “Why don’t we pray together,” I proposed after the 40th car passed us and having waited close to 1.5 hours after Annie and Nathan had already left us. We gathered in a small circle and each of us prayed asking for God’s guidance and sovereignty in this situation. With renewed sense of purpose, we tried again. To our amazement and comfort, the 42nd vehicle stopped. But it wanted RMB500. We waited again for the next one. Then a truck stopped. 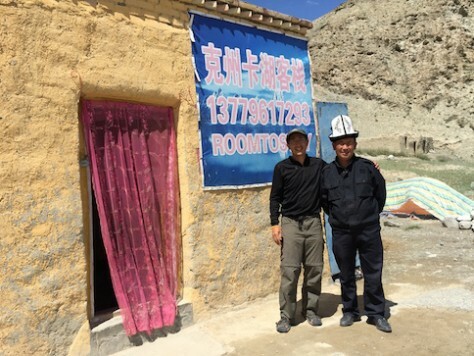 But again, the truck driver said that he would be making different stops and won’t arrive in Kashgar until mid-night. So we waited again. “Go, mommy go! Go Mommy go!” We chanted as we stared at the coming of the 45th vehicle, representing Annie’s upcoming birthday age in a few days. Then the vehicle stopped. 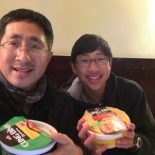 There were three Han Chinese in the SUV vehicle. 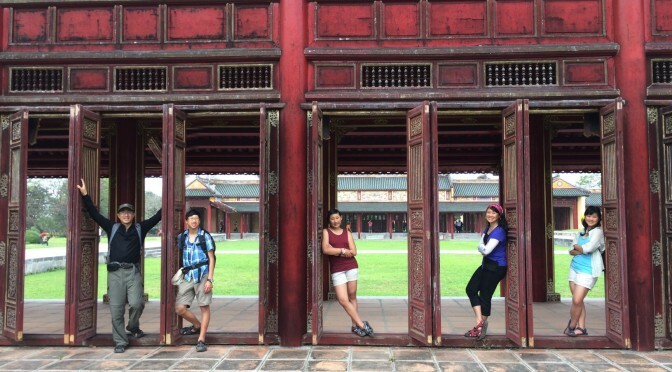 Later we found out that one grew up in Kashgar, one in BJ, and one was living in Hong Kong. The vehicle supposedly could only take two more persons but they gracious squeezed us in the back. 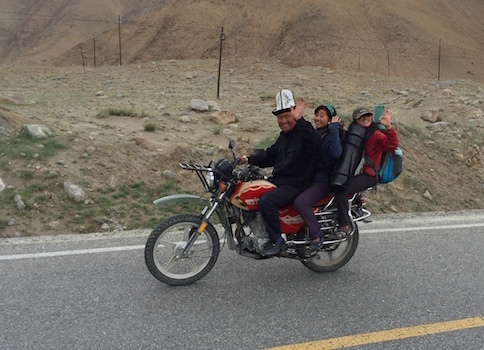 The ride was very bumpy as there were many mudslides along the way to Kashgar. The trip eventually took 7 hours instead of 4 hours. While we were stuck at one of the mudslide, our hosts even shared their delicious slides of roast beef, nan bread, and bottled water. Not only did they take us for free, they even gave us food on the way! Throughout our trip in Xinjiang, we were surprised by the hospitality in Xinjiang from people we have never met. The honey covered sweet rice dumpling was a delicious surprise! “Good!” I responded with a big thumbs up. “Good, good!” we all responded with big happy faces. 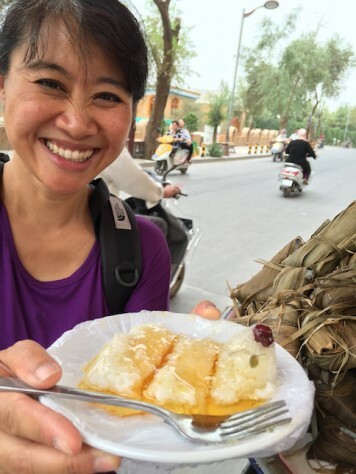 Honey glazed sweet rice dumpling in Kashgar was perfect after every meal. 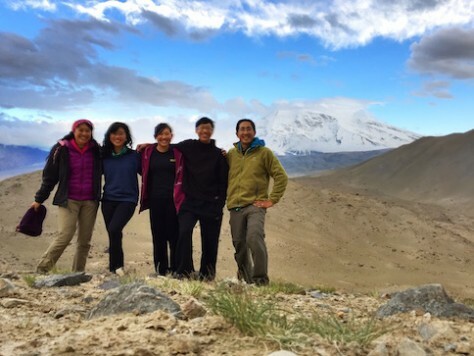 Similarly, when we first arrived in Kashgar, we met with a Uighur couchsurfing host who couldn’t host us to stay with him but was more than happy to meet to share with us more about the city. 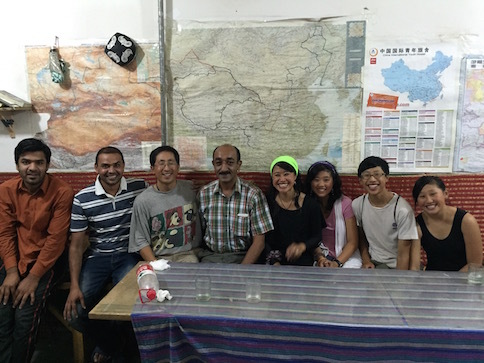 He invited us to his restaurant and shared with us about the language, culture, and religion of the people in Kashgar. We ordered lamb kebob, yoghurt, la mian (Xinjiang noodle) which he recommended. We each had our own portion which was a surprise for our family as we always share food when we eat and never have one portion to ourselves. 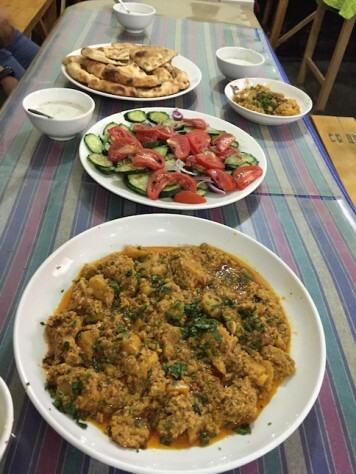 Our couchsurfing host treated us to a wonderful meal of kashgar lamien 拉面 at his own restaurant. “How much was the total cost?” I asked him at the end of the meal. “Today is my treat!” he said with a big smile. 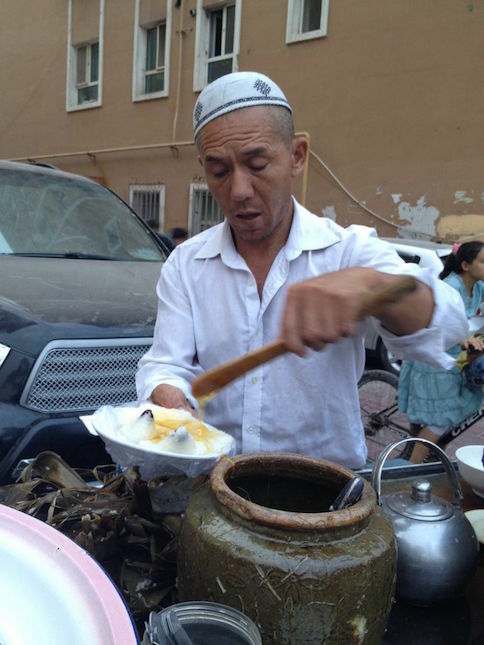 Not only were Uighur of Kashgar full of hospitality, even foreigners living in Kashgar were very hospitable. At the Old Town Hostel where we stayed, two Pakistani lived there doing business around Kashgar. When they are free, hostel guests can order Pakistani food at the hostel from them. “Your cooking smells so rich with blends of different spices,” I commented. “So how much would it cost for the five of us?” I asked him not sure whether if it is free or not. “I will ask my children to join your children for the meal as well,” Ali, the other Pakistani added. “I want to come early to learn how you cook,” Annie said excitedly. So again to our surprise, we had the whole hostel restaurant to ourselves and enjoyed another delicious meal with people so different from us but with big hearts. Surprisingly, our whole family was treated to an authentic and delicious Pakistani meal at the old town hostel. The 5 course Pakistani meal was very flavorful. The lamb meatball absorbed all the juice. Hospitality is always appreciated, especially by travelers. It is however a lifesaver when one is starving, as the case when we were hiking around Lake Karakul just 5 km from the Pakistani border in Xinjiang, China. village for some food. But when we arrived at the village we only saw small shops, called bazaar by Kyrgyz, selling dry goods such as cookies and bread. 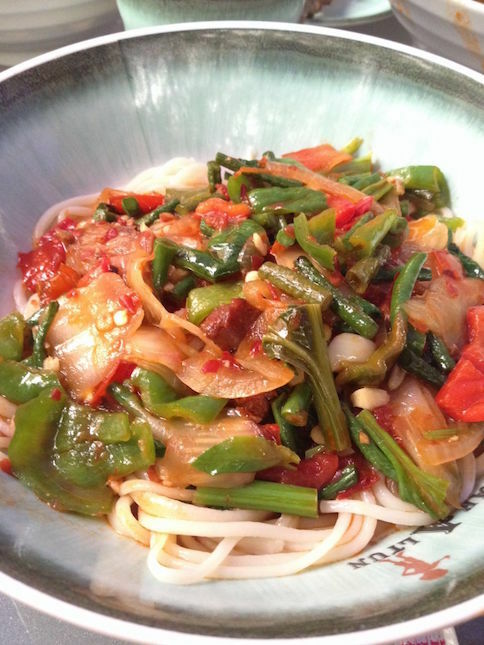 Annie observed and learned how the village woman prepared the local dish. “Hot food?” I gestured with my hands to different Kyrgyz villagers to show that we were looking for a real meal. But they all just pointed to the bazaar around us. So we had no choice but to continue around the lake hoping to find food along the way. All three children began to complain about being hungry. As we hiked, we saw a village house to the right of us. The door was open but we didn’t see anyone inside. “Go in dad, and see if there is someone, please,” The children pleaded. 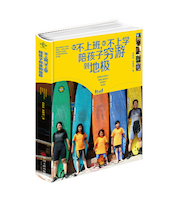 An inner bedroom door opened and we saw a mother and 3 children peaked out wondering who was speaking in Chinese. After one day of camp food, the hot rice dish by the villager was heavenly. “Hot food?” I tried again. “How much?” I asked hoping that it was reasonable. “Twenty for each person,” she gestured. We put down our backpack and gather around the stove in the inner bedroom for warmth. 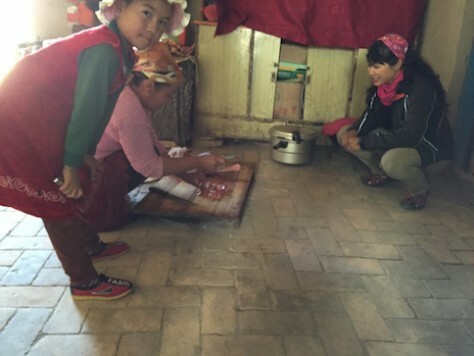 While Annie was observing how the Kyrgyz mother cooked the Xinjiang specialty rice (手抓饭), the children and I began to play games with the host’s children. “Let’s teach them to play cards,” I proposed. After the initial shyness, the children played well together with the Kyrgyz village children. 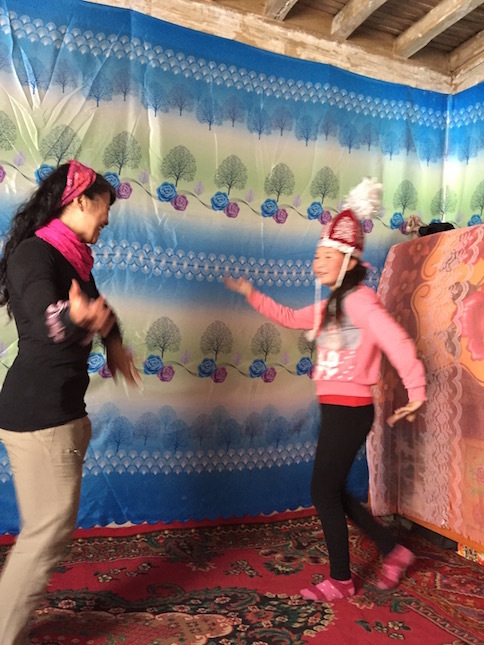 The child of the village home we went in taught us how to dance like Kyrgyz. The Kyrgyz girl taught us various dance movements. 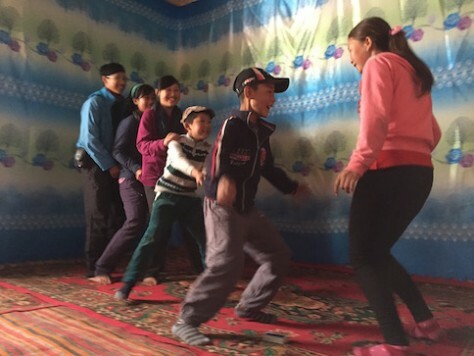 So with that ice breaker, the children began to play with the three Kyrgyz children in the room. They showed us the games that they play with each other, such as “Eagle catching little chicks”, “Duck, duck, goose”, “Breaking loose”, etc. “Can you teach us how to dance?” I proposed again, wanting to better understand their culture. 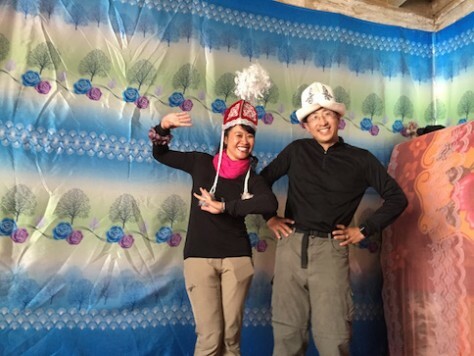 Soon, we were wearing Kyrgyz hats and trying to imitate the swing of our arms, hands, and body of our children hosts. The room was full of laughters and we all forgot about our hunger. 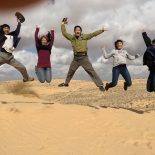 There was one person we met in Xinjiang whom we couldn’t decide was truly hospitable or not but we all agree that he was one of the most interesting person we had met. “My daughter really likes your tent. When you finish using it, can you give it to me? Not free. 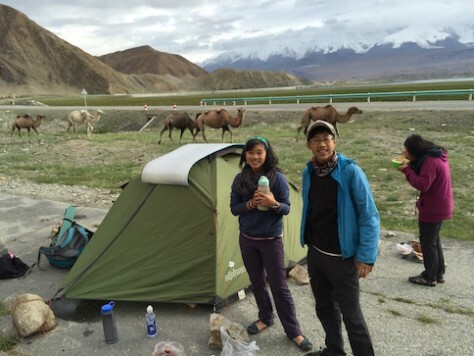 I can pay for it,” the Kyrgyz hostel owner at Tashkurgan, Xinjiang sticked half of his body into our tent and proposed with his simple Chinese. “We will be traveling for a year and using the tent. Sorry but when can’t give it to you,” I responded, still shocked at his proposal. “That is not a problem. You can mail it to me after one year,” the Kyrgyz was not fazed at my explanation. We camped by the roadside on our first night at the Karakul Lake near Tashkurgan. When he left our tent, none of us could stop laughing. The hostel owner had followed our bus on his motorcycle, stalking us to see where we plan to stay. 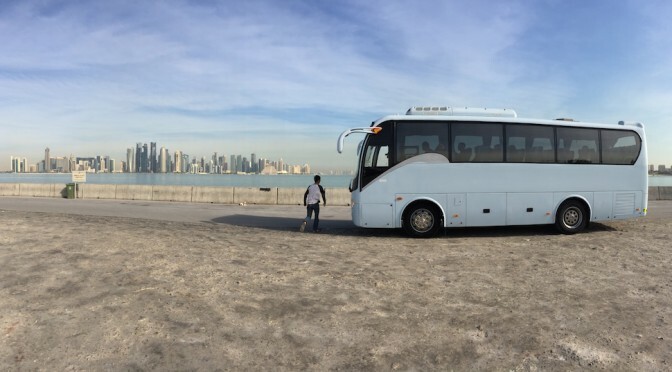 We didn’t want to get off the bus at the touristy places but wanted to find a remote place to camp. But he was very persistent and when we got off a deserted hill, he was still right next to us. We couldn’t convince him that we had no intention to stay at his hostel. 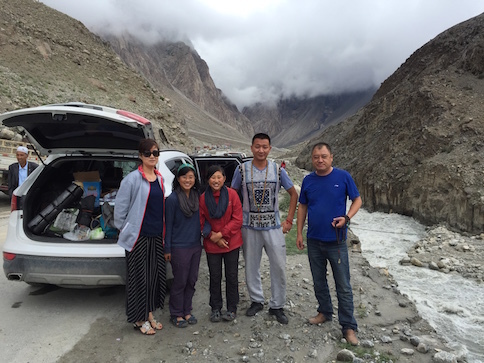 As promised, the Kyrgyz hostel owner drove us two by two to his hostel for free. He always had a big smile on him and surprisingly spoke with some perfect English accent that he learned from other travelers. For the next few hours, he came on his motorcycle to check up on us several times, not believing that we will be tenting there for the night. His persistence finally paid off as after two nights of camping around the lake we decided to stay with him for the 3rd night. “Can I have your backpack and you can have my new backpack?” he proposed to me again when we stayed with him. On the other hand, his hostel was very lacking. The toilet was non-existent, as we had to use the open back wall of a old mud house. There was no electricity to charge our devices. There was no water and no shower. The room he gave us was cold without a stove. We had to use our own sleeping bag and pillows. The Kyrgyz hostel owner at the lake was very persistent at wanting us to stay there. The hostel owner was not so hospitable it seems now that we stayed at this place. But to our surprise, half an hour later, he brought us hot water and pillows. “This place is so bad. At least, he should have a toilet. I am going let him know that I am not able to recommend others to stay here without a toilet,” I decided. “Daddy, you sound just like the demanding Serbian tourists at Lake Khovgol in Mongolia!” the children reminded me. 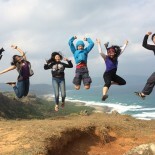 We all laughed heartily because we realized that now that we became guest, we naturally acted like guests who expect all sorts of amenities while we are only paying USD 5 per person for bed and 2 meals included! 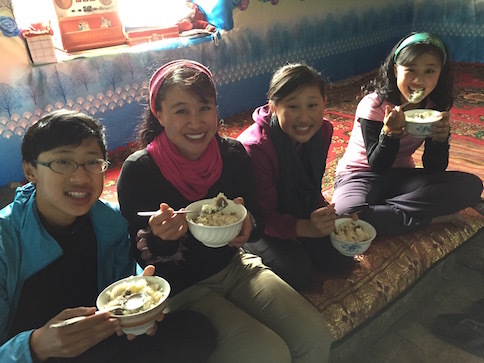 After we left Xinjiang, I asked the children about their thoughts about the hospitalities we had received. We had received kindness from those who were Han, Uighur, Pakistani, and Kyrgyz. 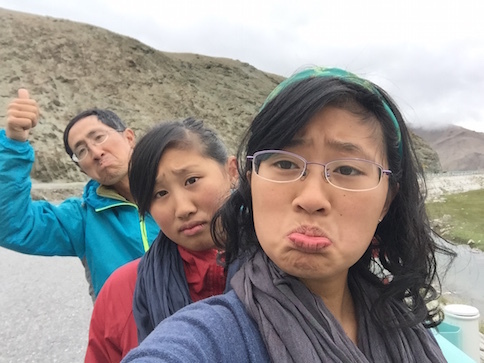 “I was surprised when the random Uighur person just paid for our rice dumpling. He only met us for a few seconds. I wouldn’t have done that,” Joani shared. 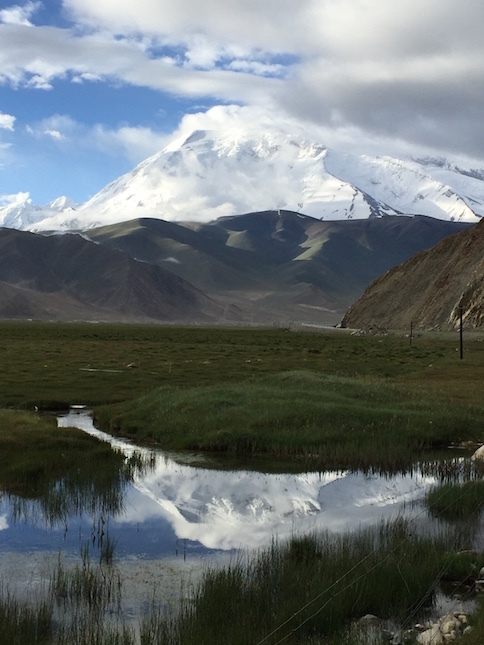 The view of the heavily glaciered Muztagh Ata (7546m) was spectacular from the Karakul Lake. The reflection of the Muztagh Ata (7546m) on the lake was serene. The Kashgar Sunday Market was a big attraction, as well as the fatten butts of all the sheep there. 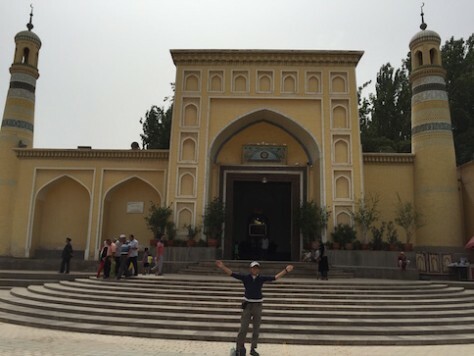 We lived in the old city in Kashgar next to their famous mosque. Safety is the best policy for food and traveling. I miss five of you very much. It reminds me of the food I had in previous trips to Xinjiang:手抓饭、大盘鸡、手抓羊肉、nan、羊肉串、拉面、哈密瓜….. This is Juan, from Spain. We met in Osh GhuestHouse. I just finished my backpacking in Central Asia and am back and safe in Spain. Let me know when u are around here and will be more than happy to show you the city. Thanks for the greeting and invitation. When we gone to Spain, we will definitely contact you. Thanks!